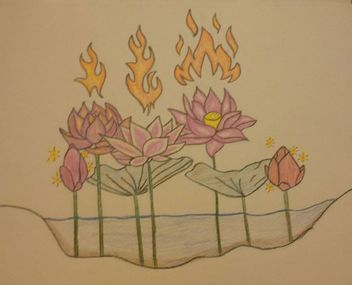 The Lotus Fire Empowerment Circle discussion and craft groups, hosted by DESC, meets on the 2nd and 4th Wednesday of each month! The discussion days (2nd Wednesday each month) consist of a round table discussion on different topics for personal growth, empowerment, and development, as well as learning ways to connect with our Selves through energy work and meditation. Our craft days (4th Wednesday each month) are themed crafts based on the previous discussion, as a way of exploring our Divine Selves through creative expression! The Lotus Fire Empowerment Circle is from 6-8 p.m. As a reminder, 6:00 - 6:30 p.m. is our 'meet and greet' time, to get to know each other and de-stress a little from our days. The gatherings are from 6:30 - 8:00 p.m. Please see the individual descriptions below for locations for the gatherings. Lotus Fire is taking a break for the holidays, but will reconvene in 2019. Have a wonderful holiday season everyone! Stay tuned for the next group of gatherings! Instructors: Mandy Ryan, Reiki practitioner & Palma Holden, intuitive & holistic consultant are working on new classes for presentation through UFM! Please visit tryufm.org to see a complete list of classes, and to see all the amazing classes Palma is offering at this time! Don't forget to return here to see our upcoming workshops as they are created! Have a blessed day all!